Do you know what it takes to make a book and the choices that need to made? Berkeley-based book artist, letterpress printer and poet, Mary Laird, will share her poetry, letterpress publishing and binding process with you. She prints her own poetry as Quelquefois Press and has taught letterpress printing at San Francisco State, Kala Institute in Berkeley, Naropa University and the San Francisco Center for the Book. 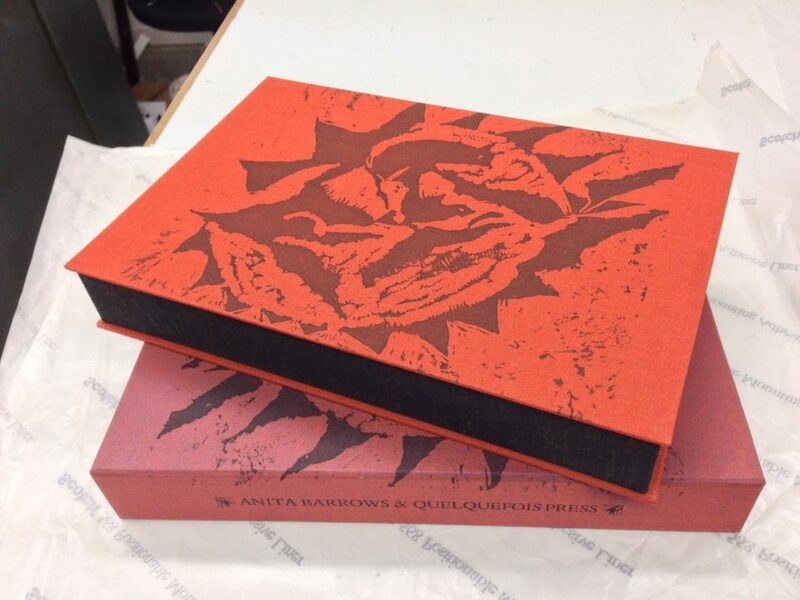 Her work is included in collections at Stanford, UC Berkeley, Library of Congress, UW Madison, the British Library, Yale, UC Santa Cruz and is part of the American Bookbinders Museum’s current exhibit, long live the book!. Satisfy your curiosity about printing letterpress books, binding them and selling them, and the perils and wonders fraught within. Join Mary for a presentation of her poems, aphorisms and stories about birthing her books, and ask her those question about the process that you have been dying to ask. Tickets are $10. Guests who wish can book a same-day tour of the American Bookbinders Museum for a reduced price.